Vaccine requirements. We require proof that your cat is current on vaccines. Our boarding rates include: Wet and dry cat food. We make every effort to follow your feeding schedule at home. If your cat prefers his or her own food or is on a special prescription diet please bring it. We furnish all bedding, food and dishes, litter and boxes, and toys. All our staff interact daily with your pet to provide lots of petting, pampering, loving attention and stimulation. We give cat treats daily, provide catnip (dry, spray and/or bubbles), we play using laser pointers and have interactive toys. We will hold your cat if he or she says it's okay. We do this at no extra cost to you-it's all part of our loving service. (Please note: cat owner is subject to charge for 1st day of boarding if cancellations are received later than 48 hour notice). Cats staying 21 days receive a 10% discount on total boarding fee. Boarding Other Small Animals (i.e. Guinea Pig or Rabbits): $25 per day (does not include food). We specialize in gentle grooming and are experts in cat handling. We offer a variety of grooming services. Please call for a reservation. Cats should arrive between 8 and 9 AM. While your pet is boarding you may arrange for any of our grooming services. We endeavor to perform these services as close as possible to your pet's departure date. 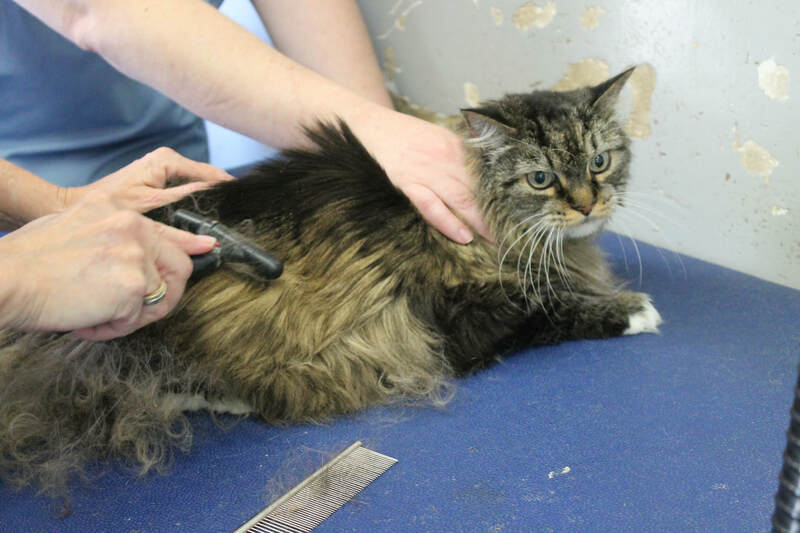 If your cat is extremely matted, please expect to pay $10-$25 more. We check every cat for signs of fleas upon arrival. If your cat has fleas, a mandatory gentle, citrus-based flea bath is required. *Full groom entails nail clip, dead fur removal, shampoo, cream rinse, drying, finish combing and a bow! We have considerable experience administering medications and caring for cats with certain special medical needs. We are happy to give medications. *Rates are subject to change. Payment may be made by personal check or cash only. Thank you. Parasite control. We check every cat for signs of fleas upon arrival. If your cat has fleas, a mandatory gentle flea bath will be required. 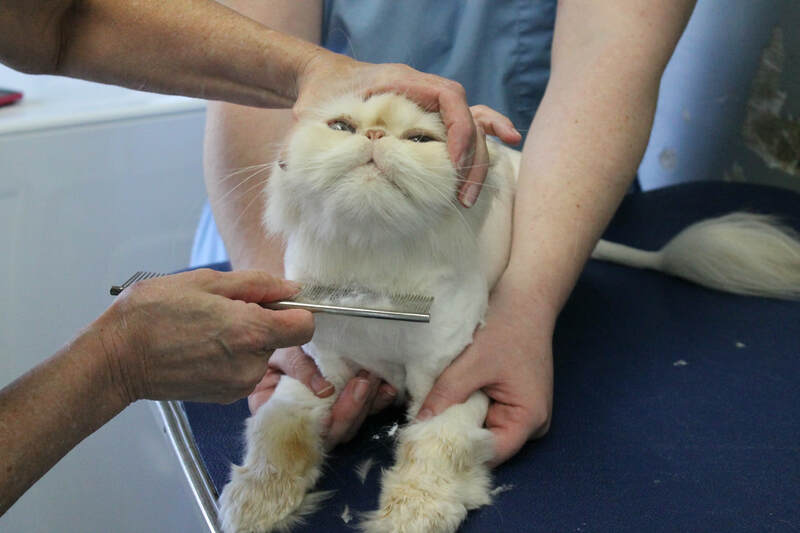 While your pet is boarding you may arrange for any of our grooming services. We endeavor to perform these services as close as possible to your pet's departure date. We cater to the needs of our clients and their cats, and we offer play pens, suites and apartment style amenities to make your cat's stay with us more comfortable. See our Photo Gallery page for pictures of these. Our experienced staff will provide the expert care your cat deserves. Reservations are required, but you may drop-in anytime during business hours to look over our facility. We are happy to show you around and introduce you to the staff and our house cats. During holiday time we have full occupancy so please reserve early. and we will treat your cat like it is our own. a friendly, loving, and caring environment. well-being are very important to us.